Maya Experience Home Stay v Panajachel, Guatemala: Zarezervujte nyní! We will charge one nights accommodation for each passenger. by the group, we can arrange the local mayan danza or a ritual by mayan Preast.. of course extra payment, but very unique experience. 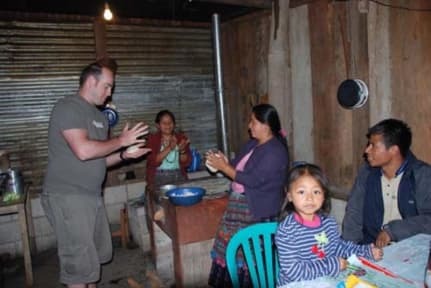 San Jorge La Laguna has started this home stay program in the village to give something back to the communities around Lake Atitlan, and also to give you a very genuine experience of living with a Maya family to experience their culture and customs. Meals in the home will be prepared by the mother of the family and you will have the opportunity to enjoy dinner and breakfast meals at home with the family. (Both are included in the price). This is very appassionated since we need to allocate you with the family where you will sleep! During your trip you can stay one ore more nights with a family from the ethnic group of the Kakchiquel in San Jorge La Laguna. This experience is runs for 7 years to the village and families who welcome foreigners into their homes. As a responsible traveler, we as guests must be aware of and sensitive to the culture by behaving respectfully during our time with the family and in the village. Although shy at first, the villagers are very friendly and welcoming people. The home stay will give you a genuine insight into the everyday lives of a local family. If you take photos of the people in the village, please always ask before you take them. 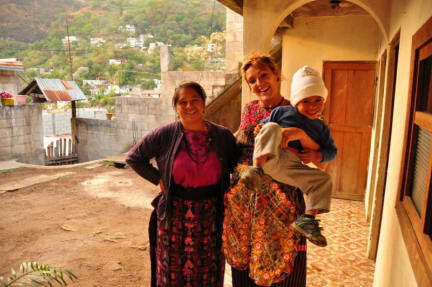 You might find the housing situation in San Jorge La Laguna rather basic but the reason for doing this home stay is to give a real insight into Guatemala, so you can experience the culture firsthand and interact with the local community on a personal basis. The coordinators of the home stay program in San Jorge La Laguna are Daniel Jiatz Pocop. We hope that you enjoy this very unique experience. If you don't show up we will charge the first nights accommodation you had booked.